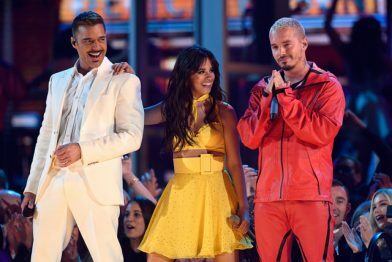 Camila became the first ever Latina to open the Grammys with an incredible performance on a stage that replicated the streets of Havana, where she was joined by J Balvin, Young Thug, Ricky Martin and Arturo Sandoval in a Latin music medley. The performance also featured a political message, with J Balvin reading from a newspaper with the headline ‘Build Bridges Not Walls’. Camila’s Dad and sister also made a cameo appearance on the Grammys stage – Watch the performance here. Camila said the ‘performance was based on my grandma’s childhood in Havana growing up in a “solar habanero”, basically a house in which every family live in a room- it was a poor community but she loved it because there was music everywhere, she was never happier’. 2018 was an amazing year for Camila Cabello! She released her debut self-titled album, which went on to become one of the biggest selling albums of the year. Her single “Havana” became the most streamed song of all time by a female artist and held the number 1 spot on the UK chart for 5 weeks. Single “Never Be The Same” was a top 10 hit in the UK and a huge success around the world. Camila also toured the world with her incredible “Never Be The Same” Tour alongside huge festival performances and supporting Taylor Swift on the “Reputation” Tour.